I can’t drive Route 9 without a swell of love for the labor that has restored our world in the past few weeks since Irene hijacked our streams. At each turn of the highway, I see orange cones where the guard rail once stood, and I know that a section of road was washed away there too. To say that a “section was washed away” doesn’t do justice to the calamity of Irene. Entire segments of Route 9 simply vanished, roots and all, leaving cavernous holes in their place. The span of each missing stretch of road can be measured by the new pavement–ten to 100 foot stretches–sobering, if nothing else. 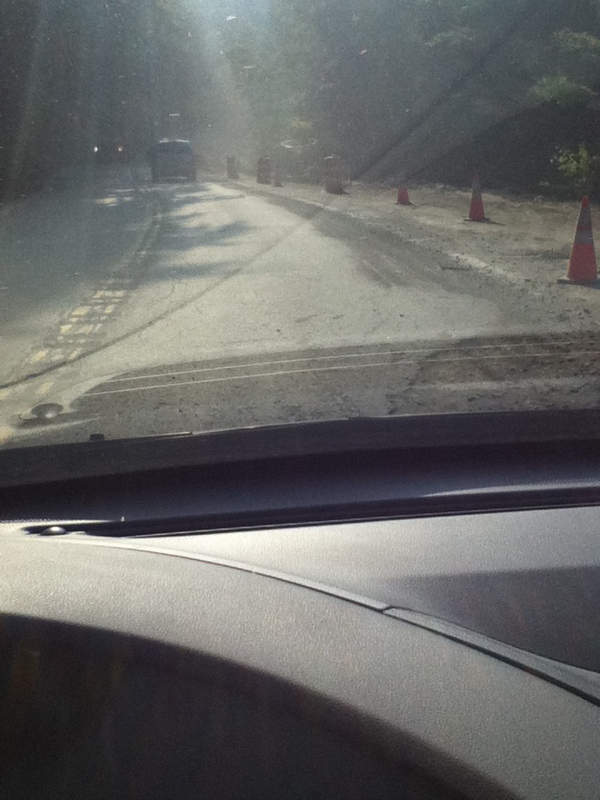 I’ve only been back on Route 9 as a driver for a week, but it’s been repaired enough for passage for at least two. That first week it opened was rough going, with dirt patches along the way, and road crews littered about. On the few occasions where I was a passenger in someone else’s vehicle (due to a post-flood carpool), my stomach churned with each new turn of devastation–a bridge missing, a hillside vacant, a stream bed ten times its original size. I worried aloud for the safety of drivers–those who didn’t know to slow down, and those who might be hurt because of that. I worried about rain, and new wash outs, and dampened spirits. I kept to the backroads. They were familiar. And dependable. Some had been destroyed, but their repair seemed simpler, more straightforward; and I knew how to drive their earthy contours; and felt safer because of their realness. And still, I was drawn back to the nightmare of Route 9, to its curves and climbs and horrors, just as I was tonight. At 6:00 pm, the road crews were gone, and the setting sun made purple mountain majesty of the sky, transforming everything, even the mangled roads, into… beauty. As I approached my turn at Route 9 and MacArthur, I saw that most of the rubble which has defined it has been cleared away; and I almost miss it. My sister comes Friday and I want her to see what pain has been inflicted upon us. And yet, I’m equally afraid for her safety as she drives up my half-eaten dirt road at night. It’s narrower than ever and there’s no room for cars to pass in both directions at once. And what if it rains? Tonight, I climb MacArthur without another driver in sight, and notice new gravel poured into the stream side of the road. I wonder where it came from, and how long it will take before they finish the job that overwhelms me just thinking about it. There’s a large yellow truck at the top of the hill, and I slow down to take a look at the work that began yesterday at Neringa. Three weeks ago, a hundred wedding guests were stranded there when the bridge across the Whetstone collapsed. 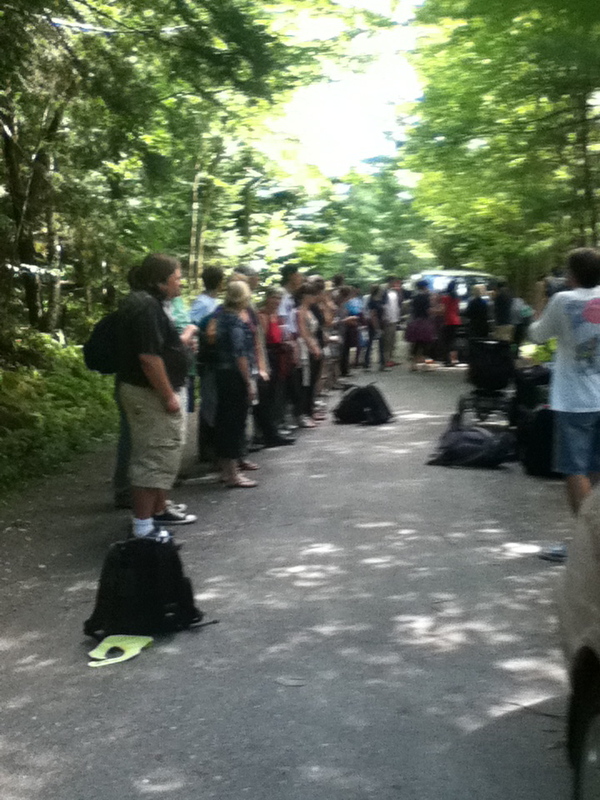 Neringa wedding guests lining up for transport out of Vermont. There’s no sign of a bridge yet, but Bennett and the operator of that huge yellow excavator are talking, like men do, figuring out what’s what. The trees that fell across the bridge were removed yesterday morning, and the monstrous culverts that ended up downstream were retrieved in the afternoon; so perhaps replacing them is next. I’ve never thought too much about road making and bridge fashioning until now. I never thought too much about watersheds and erosion and stream redirection either. But for the past three weeks, I’ve been intrigued by every bit of it. Every bit. When it doesn’t make me cry or cringe, driving on these roads makes my heart swell with every labor of love. 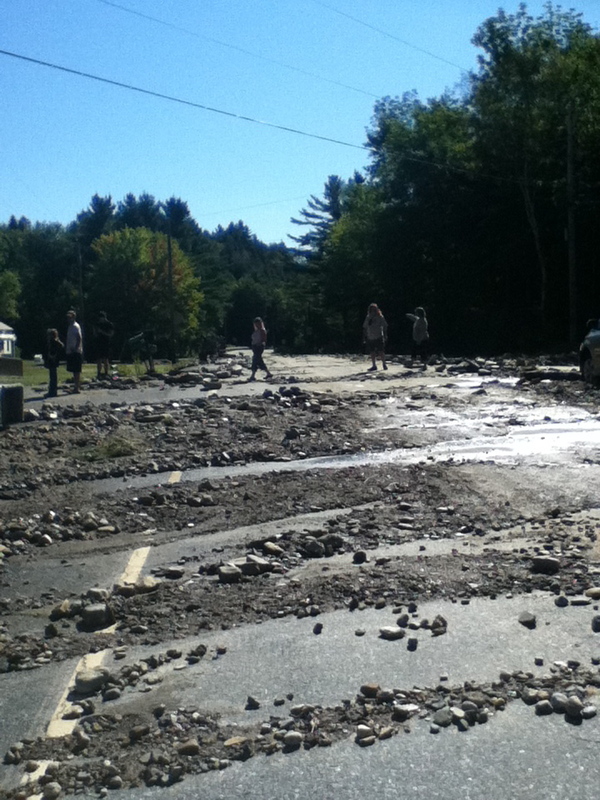 For more on Irene in Vermont, click here. So true. It’s amazing how quickly some badly damaged roads have been repaired in a short amount of time. As a newcomer to the area, I’ve been so impressed by the wonderful people of Vermont. So true, everything that has been written in the article. We as the people do rise to the occasion, (certainly no pun intended). We rise to the occasion when catastrophe is upon us. We become as one, sacrificing and stretching out our arms to others in many different and pertinent ways. However, it’s mostly only when the Armageddon is upon us that we truly become “human.” Otherwise, we behave in a more…let’s say…subdued way. We are not always there for others, especially when it may cost us something, where we ourselves may have to sacrifice. It would be nice, at least from my perspective, to see us there for others, where no one will ever know, at least the public won’t know, of how we are stretching out our arms. It’s not as thrilling and blood pumping, just more real, and even more important. Your writing is heartfelt, expressive and I love the little bits you threw in, ‘every bit’ and ‘every labor of love.’ Such wonderful ways of expressing yourself. Thank you, I loved this! I hope everyone is recovering from Irene, I grew up in NH and a lot of friends and loved ones in the area were affected too. Prayers for everyone!